Director Amit Masurkar's political satire "Newton", starring Rajkummar Rao in the lead role, will be India's official entry at Oscars 2018, the Film Federation of India announced on Friday. The Hindi film was the unanimous choice of FFI's selection committee, headed by Telugu producer C V Reddy. 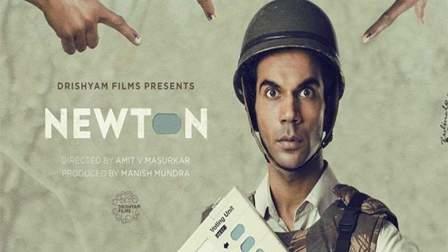 "'Newton' has been selected as India's official entry to the Oscars. It was unanimously chosen from 26 entries this year," FFI secretary general Supran Sen told PTI. The decision to choose the film, which was released commercially today, for the Oscars was the proverbial "cherry on the cake", said actor Rajkummar Rao. "It is a really honest film and we are already getting an overwhelming response. We will put all our energies to take the film forward," the actor told PTI. Director Masurkar added that it was a double celebration for the team. "We are really happy. The fact that the film is releasing today doubles the happiness. We hope that people will now really head to the cinema halls to watch the film," the director told PTI. The film is a political satire revolving around an honest election officer's attempt to conduct a free and fair poll in a conflict-hit area of Chhatisgarh. It also stars Pankaj Tripathi, Raghubir Yadav and Anjali Patil. "Newton" is Masurkar's second directorial venture after the 2014 indie "Sulemani Keeda".